It’s called the “Gateway to the Underworld” by local Yakutians. 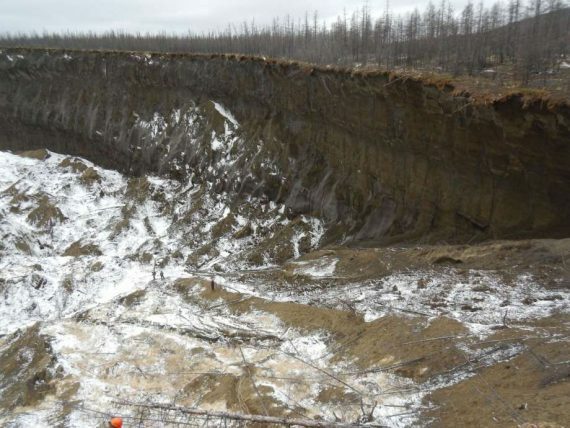 It’s a giant Siberian crater in the coldest area of the world that doesn’t get as much publicity as its more recent counterparts but, because of its size and rapid growth, may be the most dangerous of all. 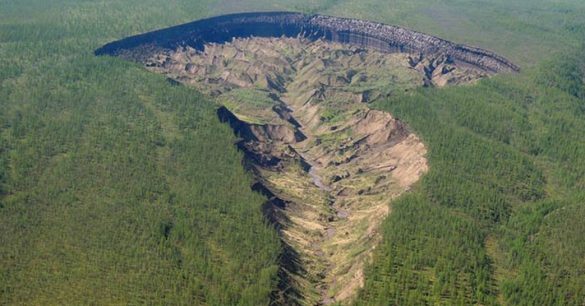 It has spawned scary terms like “megaslump” and “scar zones.” It’s the Batagai crater and it’s making geologists and Siberians very nervous. Geology professor Julian Murton of the University of Sussex describes the crater as seen on his recent trip to the village of Batagai in the far northern reaches of the Sakha Republic (and thousands of miles east of the Yamal peninsula craters). He is conducting a long-overdue “pilot” study of the Batagai crater, which formed in the 1960s after a loggers cleared the area to make way for a road to an industrial area. The newly-barren land caused the permafrost underneath to thaw and collapse … and collapse and collapse some more. The “gateway to the underworld” is now over 1 km (.62 miles) long, 90 meters (300 feet) deep and growing at a rate of over 15 meters (50 feet) per year. The scary nickname is deserved not just because it’s big and deep … the Batagai crater is making noises too as it consumes large chunks of the area on a regular basis and drops them deep into its netherworld. Professor Murton and his team are cautiously venturing in and around it because he’s concerned that this “megaslump” – a massive void in the permafrost – will continue to sink into the “saturated slurry” underneath. He fears peering into the crater is not just a look into Siberia’s past but also into its future. There’s that word again … climate. Is the Batagai crater a gateway to hell or a symbol of the hell that awaits as the coldest spot on Earth warms and the planet slowing collapses? Is Siberia in a megaslump or are we … striking out at every attempt to get to first base on climate change? Murton has one last thought as he studies what happened during the last Ice Age.